A new section is now online on our website, dedicated to the new combat miniature game Battlestar Galactica - Starship Battles. Based on the “Battlestar Galactica” TV series, the game will debut at Spiel 2018 (October 25th to 28th, Essen, Germany), where the first copies will be available for sale, and will start to hit the stores in November. 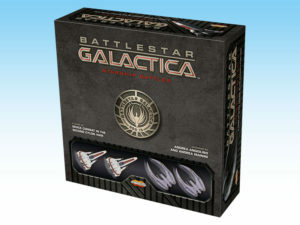 Visit the Battlestar Galactica - Starship Battles section for information about the game and images.